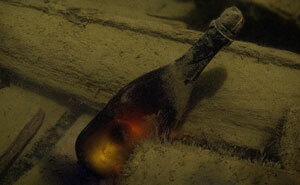 The provenance of a wine is a combination of its purchase and storage history. When you buy any wine at auction you are taking a risk that the wine has been carefully handled by the original owner(s). If the wine has been exposed to excess temperature variation, for example, then there is a chance that the wine has become oxidised and lifeless. Our aim is to minimise your risk by providing you with essential knowledge and as much information as possible about a particular wine. Wickman's will now be grading each lot of wine based on our ability to obtain this information, thereby increasing your own ability to assess any bid. Most lots describe the provenance of that lot and you are encouraged to read the description as part of your buying decision. On lots that have been marked with this symbol (or in the catalogue with the words "Verified"), it means we have taken extra steps to prove and verify the provenance of this wine and will guarantee the wines purchasing and storage history. This is exclusive to Wickman's and not something that is typically offered by other wine auctions. It generally means that this wine is from a reputable wine collector and we have verified his or her claims of purchasing and storage history by visually sighting documentation and inspecting the cellaring site and sometimes by even sampling random vintages and bottles from the collection. On lots that have been marked with this symbol (or in the catalogue with the words 'Checked"), it means we have taken steps to discover the provenance of this wine but have not verified it through documentation or other means. This is generally the most that is offered at other wine auctions. Whilst the owner of this wine has informed us where it has been purchased and how it has been stored we have not gone through our process of verifying the validity of the claims. On lots that have been marked with this symbol it means the vendor had enough confidence in thier wine to offer up a sample of this wine for general, public tasting, typically at a member event hosted by Wickman's. On lots that have no markings, it does not necessary mean that there is any problem with this wine, it just means that we have been unable to discover the wines previous owner, perhaps because it was purchased previously at auction or that it was given as a gift or prize. The best handling and storage in the world cannot prevent faults from entering a wine at bottling time and it is possible that the wine you purchase at auction (or from the winery or a retailer for that matter) contains cork taint, Mercaptan, random oxidation or something unpleasant that may affect your enjoyment of the wine. Whilst we make every effort to discover the provenance of a wine, we cannot guarantee the wine in the bottle you purchase. Also see our explanation of terms used when describing bottles in our wine auctions.